A quick weekend jaunt to Stratford comes with hip breweries, incredible food and perfect spring wardrobe shopping. Springtime in Stratford is full of weekends at hip restaurants, breweries and shops. All photos by Justin Harrington. I don’t know about you, but once spring rolls around, I’m excited to get out and explore on little weekend getaways. Something about the longer days and the warm sun just invite adventure of any kind. After spending a weekend in Stratford during the holidays, I couldn’t wait to get back to explore again in warmer temps. 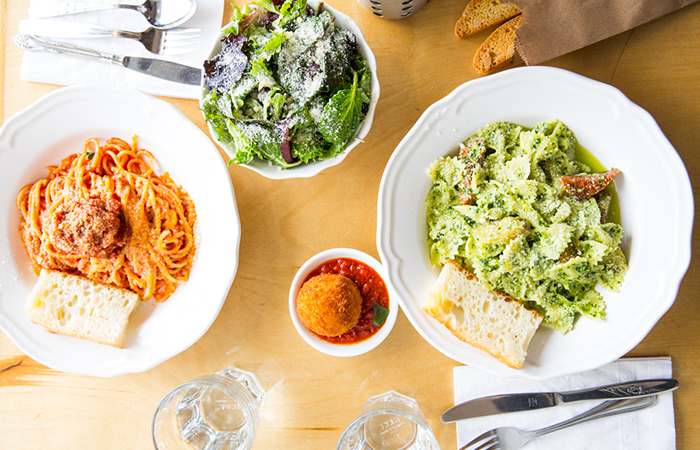 Stratford may be known for the theatre festival that happens every summer, but it’s really a foodie’s delight and has a restaurant and drink scene that would rival any major city. 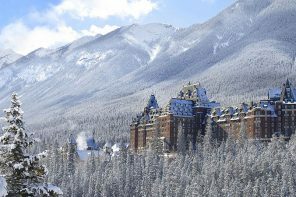 Best of all, spring is an amazing time to visit because it’s not quite at the peak busy season of summer, and there are plenty of incentives (distillery tours, incredible brunch, great hotel stays, and spa time) to make the roughly two-hour drive from Toronto. Here are 10 things that made me fall for Stratford even harder. 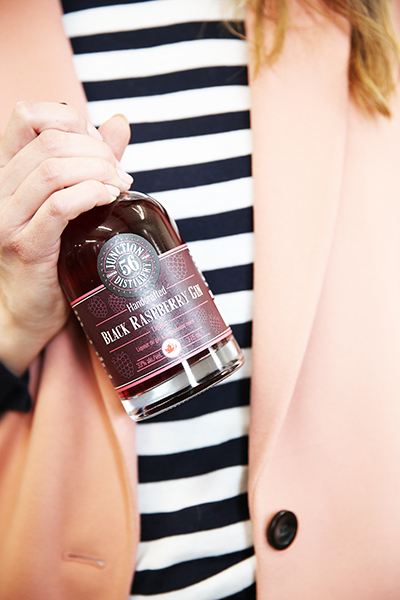 Junction 56’s blackberry gin is one of their best sellers. It’s not hard to see why, it’s so fresh and tastes like spring! Sip on gin, vodka, whiskey, moonshine… oh, and beer! Proof that Stratford has the hip vibe down? The Junction 56 Distillery and Jobsite Brewery, located just a bit off the main drag. 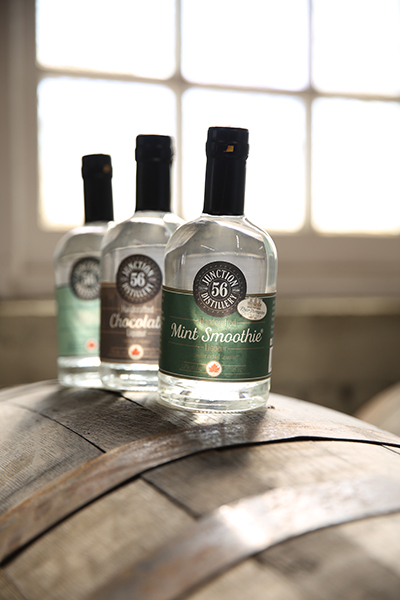 Junction 56 also has a selection of chocolate and mint gins. The Junction Distillery is known for their small batch whiskey, but when they’re not brewing up whiskey they’re experimenting with gin, vodka and moonshine, all of which you can sample during a tour. Go on a full stomach because they give 16 (yes, 16) samples to try. 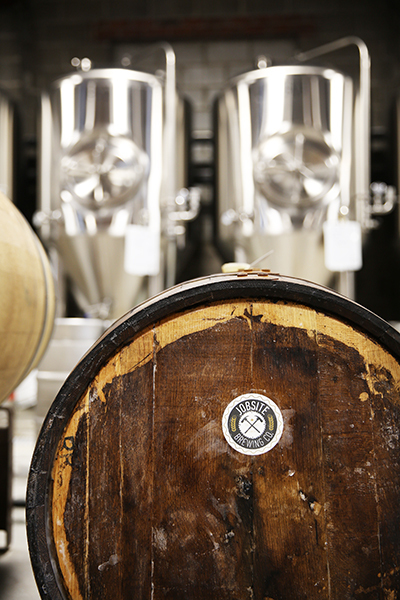 Save some room for a flight of craft beers at the bustling, hip brewery Jobsite. After the gin, vodka, whiskey and moonshine samplings, there’s always room for beer, right? Located in the same building, behind the distillery, is the Jobsite Brewery, where you can also do a little tour and test out a flight of stouts, lagers and ales. The beer and brewhouse are run by two former construction workers (hence the name) who both had a love for beer of all sorts. After a tour, grab a pizza at their pizza bar (your stomach will thank you for it). 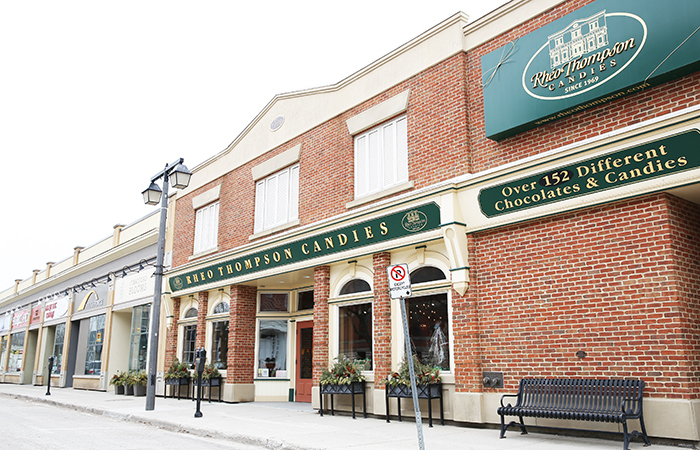 A must-stop on the Stratford Chocolate Trail… Rheo Thompson Chocolates. One thing I love about Stratford is their trails. It’s a chance to poke around town and pop into shops and stores you may not have thought about checking out. And in this case, it’s a trail of chocolate. You can pick up your chocolate trail pack at the tourism office for $30, which gives you six tickets to collect yummy chocolate samples along the trail. There truly is some pure joy in handing over a ticket and getting a truffle, ice cream, hot chocolate, etc. back in return. The toast selections at Edison’s Cafe are so yummy, so drool-worthy that you’ll be making repeat visits for brunch. 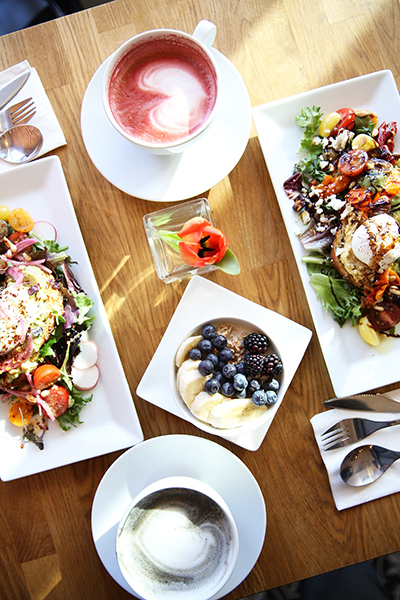 There’s no shortage of good eats in Stratford, but one spot you’re going to have to hit up if you’re a brunch fan is Edison’s Cafe and Inn. (You can stay here too if you want! There are chic guest rooms above the bustling cafe.) You’ll want to ask about the history behind the name of the cafe and inn. Thomas Edison actually did live in the building. Known for their avocado toast and unique lattes, you won’t be short on Instagram photo opportunities (opt for the pretty pink beet latte or the charcoal latte for a switch up from your regular). I also went for another toast option–the lemony hummus toast topped with fresh greens and tomatoes, which felt like spring on a plate and is a dish that alone would bring me back to Stratford. 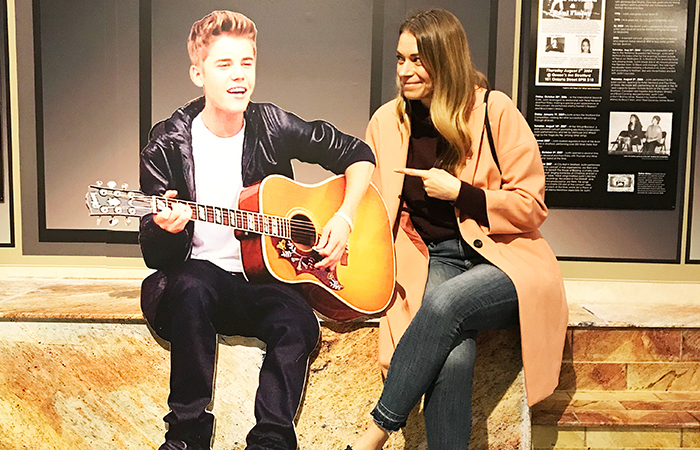 Get caught up on Justin Biber’s humble beginnings at the Stratford Perth Museum. Stratford is Justin’s hometown. It’s where he grew up and started his starry career. And the residents of Stratford seem to be just as proud of Justin’s success as any family member is. So it only made sense for the Stratford Perth Museum to create a Justin Bieber exhibit. The museum may be small, but the love for Justin is far from that. Memorabilia from his childhood (like hockey bags, old photos, past awards) plus countless items donated by the singer, his family and the Rock & Roll Hall of Fame give a glimpse into the life of this small-town boy who turned into a mega star. 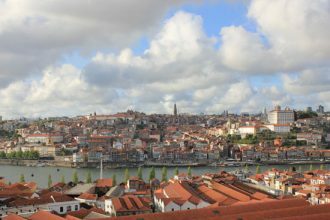 You’ll leave with a new appreciation for his talents and love of his town. And you won’t be the only one… make sure to check out the map to see where people have travelled from just to see this exhibit! Go hungry, very hungry, to AO Pasta. We’d say that Stratford should be known more for food than its acclaimed festival–and that’s saying a lot! The food in Stratford is indescribably good and on the same level as what you’d find at trendy urban spots in Toronto. Even if it’s something quick and easy, from a giant bowl of piping-hot, fresh, homemade spaghetti, arancini balls, salad and gnocchi at AO Pasta (you can grab their express lunch menu until the end of April, then they will be full on evening dining), to a traditional Italian dinner at Fellini’s (pretty much anything you dream of Italian wise is on this menu and set in a rustic, bustling eatery). Stratford is full of healthy food options, like this Hippie Bowl from Keystone Alley. 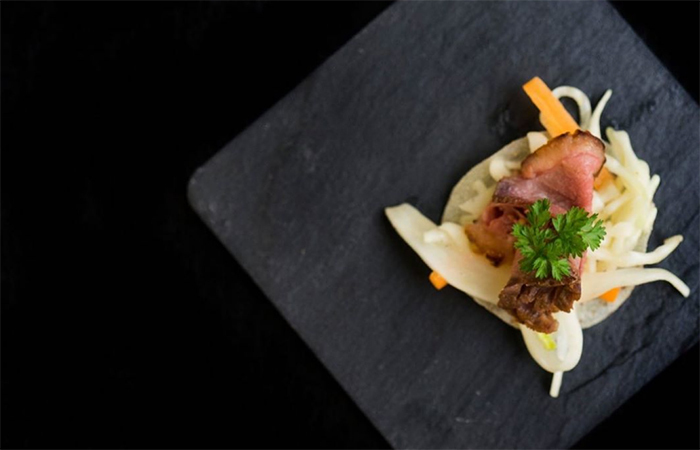 Or for healthy nibbles and dishes, head to at Keystone Alley. 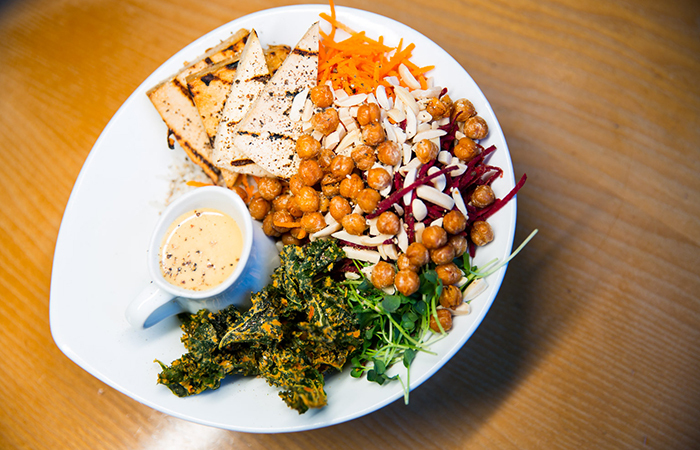 Seriously, you need to try their Hippie bowl with crunchy chickpeas, arugula, rice and tahini, and the kale chips. And take advantage of their leaf-lined alley seating too. 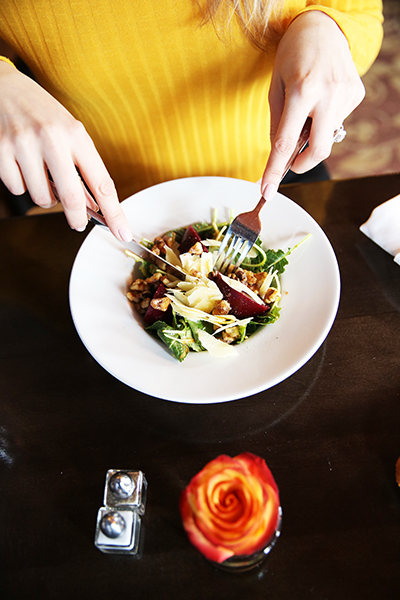 Delicious and healthy eats at the Parlour Inn. Another healthy option is to grab lunch at the Parlour Inn. This historic building is steeped with history and has a cozy vibe, but the selection salads and veggie wraps are definitely worth a visit. Culinary adventures await at Stratford’s Chefs School. Photo courtesy of Stratford Chefs School. Part of the reason why Stratford is such a hotbed for food has to be because of the Stratford Chefs School. The school has been producing some of Canada’s best chefs since 1983 and boasts more than 700 on its alumni roster. The school offers cooking classes and also gives patrons a chance to sample the food from the chefs in training at the seasonal dining room (open when the school is running classes for students). The school is an incredible gateway to the heart of Stratford’s love and appreciation for food. Doesn’t this just say spring! Resonance is the perfect spot to up your spring and summer wardrobe. Stratford may be small in size but it doesn’t lack for cool shops. I love coming to Stratford to pick up gifts throughout the year (and let’s be honest, I also nab a few things for myself). 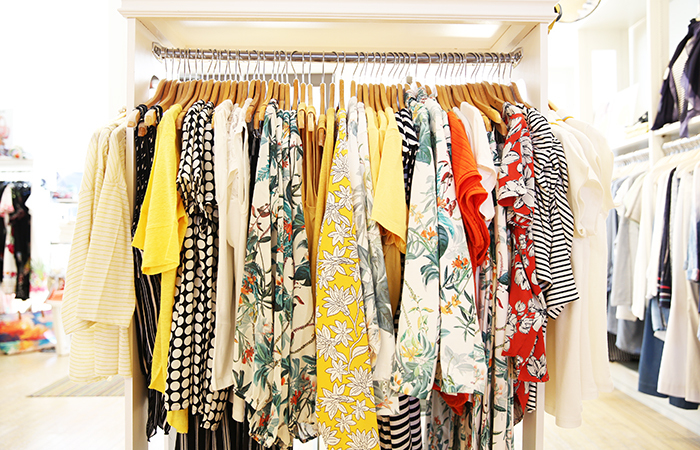 Resonance is a fashion boutique that will invite you to upgrade your spring wardrobe with bursts of cheery yellow tops, floral dresses, white denim and a plethora of sunnies. Small-Mart is a store full of wondrous, quirky finds. 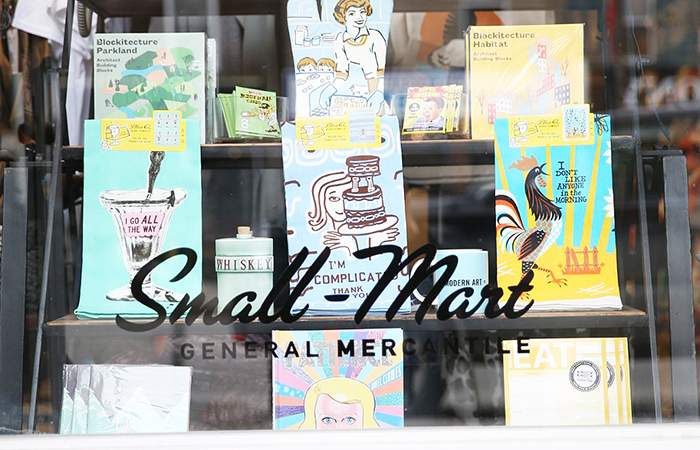 For fun and quirky gifts, a stop by Small-Mart will keep your attention for at least 30 minutes (I dare you to step inside and try not to be enticed by at least a few of the countless kitschy, one-of-a-kind finds). 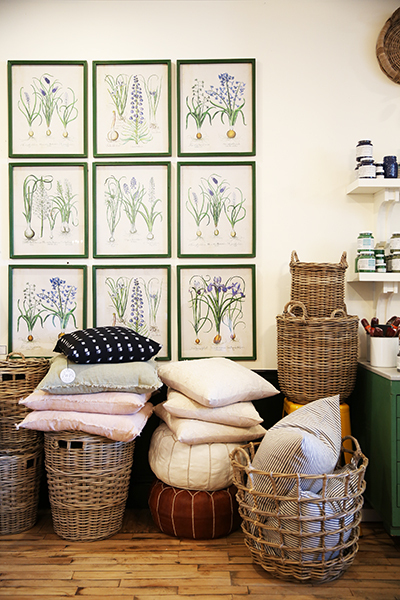 Home decor finds can be found at the ultimate gift store, Wills & Prior. Another favourite that I always visit is Wills & Prior. Whether you’re searching for the perfect gift or simply on the hunt for some home decor inspo, a step inside Wills & Prior is a must. One of the best things about Stratford is that community feel. Sign up for a paint night at the Stratford Gallery, where you can let your creative juices flow (classes vary from watercolour to sketching), sip on bubbly or wine, and nibble on chocolates at the same time. We can’t think of a better night out when you factor in all of those elements. There’s honestly so much to do in Stratford during the spring months that it can be difficult to narrow down the options and plan out a quick weekend stay. The Stratford website now has a sleek planning app that allows you to map out and schedule your fave places to check out (so you can make sure you fit in enough yummy food in between shopping and gallery hopping). It’s available via the website for easy access. 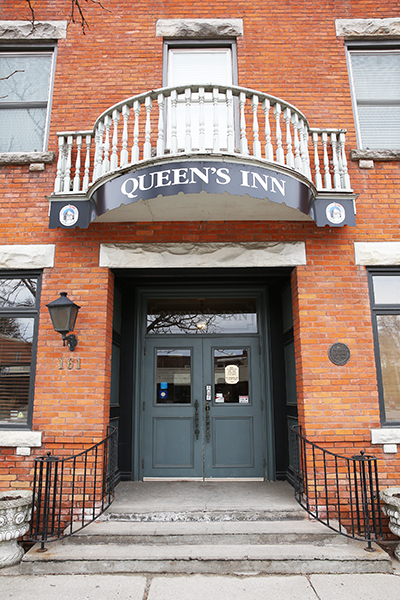 Save on hotel stays during the sprig months and rest up at the historic and much-loved Queen’s Inn in Stratford. Since it’s not the busiest time of year for Stratford (summer is peak season), spring is when the town is ramping up for all those festival activities. That means savings for you. You can find great hotel/BnB deals and even score some cheaper tickets to events and shows at this time of year.